Hey! 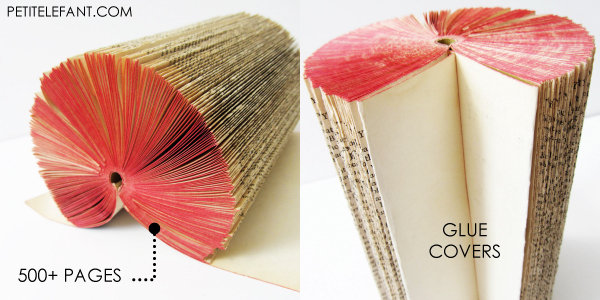 It’s me again, Steph from Stuff Steph Does again, and I’m here to show you a super simple DIY project from old books that will help organize your work space while looking really cool at the same time! While out flea market shopping with my two girlfriends in Chicago last year, we came across these beautiful, old, vintage-looking folded books for sale at a vendor’s booth. While they were cool, we balked at the 20 dollar price tag. Twenty bucks?! We can totally make these ourselves! 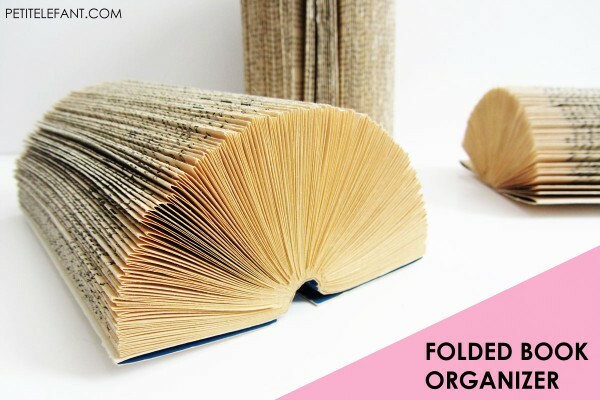 And just like that our day of flea market shopping was cut short and we made our way to the thrift store to find some good books for folding to spend the rest of the afternoon making these fun folded book organizers. This is an easy project that’s fun to do with a group of people or while you’re just sitting in front of the TV and want to do something with your hands. That’s probably the smallest DIY supply list ever, right? If you don’t have any books that you’re ready to make unreadable (because they will be after this craft), head on over to the thrift store and you’ll find plenty of books for under a dollar each. Look for books with yellowed pages and smaller text. Go for paperback, too. 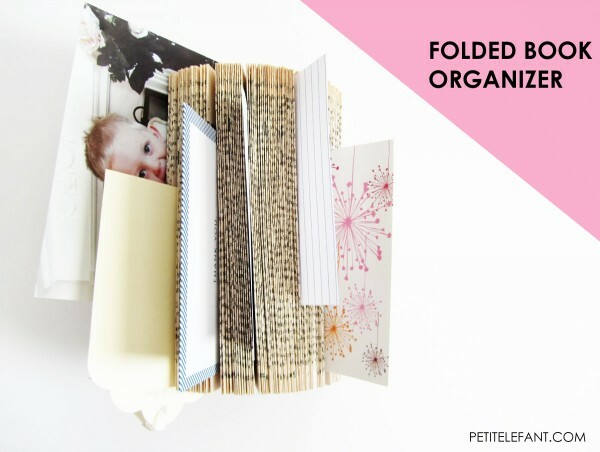 Get ready to get your fold on! 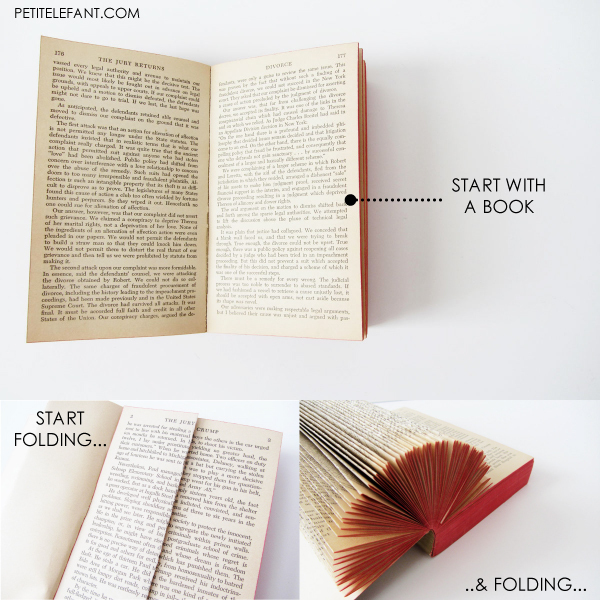 Simply fold back each page lengthwise toward the center of the book. Your fingers are going to get a little messy as the ink will smear a bit, but it will wash right off, no problem. I picked this book above for its yellowed paper, good text size, and red-edged pages. However, the book was so thick that it ended up making an entire circle instead of laying flat. I glued the covers together to make a full cylindrical organizer that can stand on end. If you want yours to lay flat on the table, 300-ish pages seem to be the golden ticket. When the books lie flat, there is no need for glue at all. The pages stay put on their own. Make a bunch of these to organize your receipts, note cards, photos, or whatever else you have cluttering up your work space. 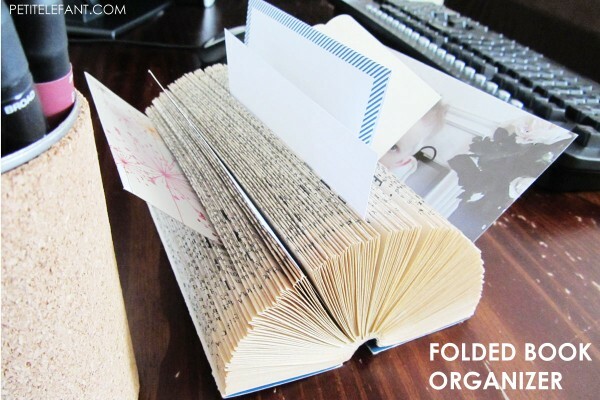 Have fun making a cool folded book organizer. They’re one of a kind, (sort of).